← Owen Meet Calf, Calf Meet Owen! 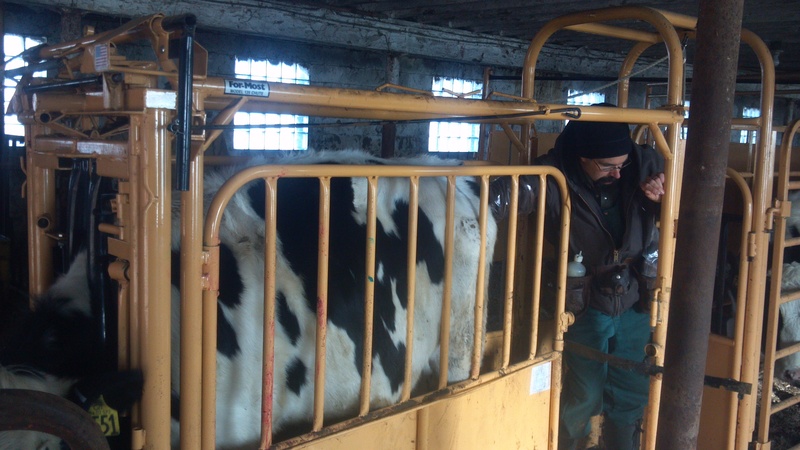 Once a week the Vet visits the farm solely to check to see if cows are pregnant. A couple of years ago (loyal readers may remember me posting about it) we had a bull who quite doing his job (getting heifers pregnant!) Since then we decided to randomly pull a few heifers out and preg-check them once a month to make sure the bull is still working. Here is Carlos really getting into his job! I’m happy to report that the bull is still getting the job done! This entry was posted in Animals, General Information and tagged agriculture, Animals, cows, dairy cows, dairy farm, dairy farming, dairy farming today, factory farming, family farm, family farming, farm, farm animals, farmer, farmers, farming, food production, Modern Agricuture, modern farming, organic farming, production agriculture, sustainable agriculture, Wisconsin dairy farming. Bookmark the permalink.